There are a very large number of stereoscopic 3D image formats in use today, and they are constantly evolving. One of the reasons for the creation of 3DCombine was to allow users to easily convert their images between these formats to meet their viewing, archiving and publishing requirements. This page details the main 3D Image formats; gives a summary of their strengths and weaknesses; and explains how they are meant to be viewed. Note that a 3D Image format is defined here as an image file that can be loaded and saved. Most people are familiar with the classic red and green 3D glasses. These allow you to see a black and white (monochrome) 3D image as the left eye can only see the parts of the image in red and the right can only see the parts in green. The best thing about this format is that it appears as a standard picture. It can be loaded, saved and even printed and retain the 3D effect when glasses are worn. The weakness of this format is that the image is monochrome and can cause eyestrain if used for an extended period. Also, once in this format the colour information can never be recovered. 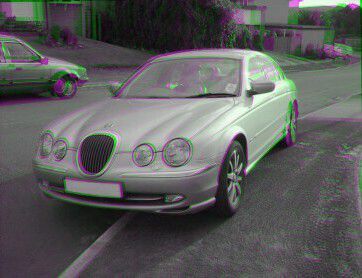 An improvement on grey anaglyphs are colour anaglyphs. These utilise red and blue (cyan) glasses to enable you to see a colour 3D image. This is because the cyan filter allows through both green and blue light. So in conjunction with the red lense, a full RGB image is seen. The negative side of this approach is that eyestrain is often worse than with the grey anaglyph glasses. This is especially true where there are regions of pure colour, e.g. red, that appear dark in one eye and light in the other. For this reason, the image is generally processed to reduce that effect. It's also worth noting that while all the colour is kept, it can be difficult to recover a full colour stereo pair. 3DCombine has a special function 'repair anaglyph' to do this. These are a variation on a theme where the glasses have yellow and blue lenses instead of red and green ones. The yellow is a combination of red and green wavelengths and so a monocrhome or full colour format can be created as before. The advantage of this is that both eyes get a slightly better balance of brightness compared to the red/green anaglyphs where the red eye can appear very dark. This reduces eyestrain somewhat. A further refinement on the anaglyph principle. One eye sees red and blue wavelengths (magenta) while the other sees green. This is the best possible combination as red and blue are each percieved as darker colours than green. Putting the red and blue together and the green seperately makes for the best possible brightness balance between the eyes. These glasses are more difficult to make and so less common. A popular children's toy is a pair of fake binoculars which show you a 3D picture when you look through them. These work by having two parallel images, one for each eye. They show only the left picture to the left eye and the right picture to the right eye creating a 3D effect. However it is actually possible to view these images without any assistance in the same way as with stereograms (magic eye pictures). Simply look through the monitor at some point in the distance and the 3D image will appear. The picture shown here is actually cross-eyed format which means the left image is on the right and vice-versa. This is an easier format to free view: Simply sit a fixed distance from the monitor and place a finger on the monitor between the two images. Keeping your head fixed and focusing on the finger, move the finger towards you and you should see a 3D image appear behind it. Now try and focus on the 3D image instead and slowly move your finger away without looking at it. This format is implied by files with the JPS extension. The advantage of both formats is that no information is lost. Two full size, full colour images are retained and can be converted to any other required viewing format. This makes it a great choice for general storage and archiving. In this format, the two images are interleaved a line at a time. The first row is from the left image and the second from the right image and so on. This format is required by certain of the LCD glasses and passive stereo displays. The [now obsolete] Zalman 3D Monitor used this format. It retains all the colour of the image both only half the vertical resolution. It is also relatively slow to compute so not a great choice for videos. There is a variation on a theme called vertical interlace, where the images are column interleaved rather than row. 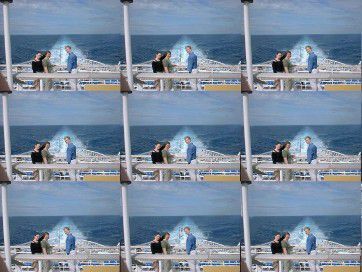 This format is designed for use with stereoscopic DLP TVs and has the images arranged in a checkerbox fashion. It has the advantage that the image retains the original dimensions, despite being 3D. This means that no special recording/playback equipment is needed and the files are (generally) no larger. It also has the advantage over the interlaced formats that the reconstructed images have fewer artifacts. This is a special format for the [now obsolete] iZ3D range of 3D monitors. It must be displayed on a dual head display with the left image on the 'back' display and the right image on the 'front' display. This currently must be done in a program outside of 3DCombine, though it can generate the correct images. This format consists of an image and a matching depthmap. This makes the format independent of the viewing technology and allows multiple images to be generated from just two. It is required for auto-stereoscopic and lenticular displays. This format also has the advantage that the amount of depth (3D effect) in the image can be altered - the only format where this can be done. The down side is that these images cannot be viewed without further processing. They can also be difficult to produce requiring either manual creation of a depthmap, a special camera which can capture a depthmap or creation of a depthmap from a stereo pair. The results of the latter can vary, though 3DCombine offers a couple of ways to do this. This format is also the intermediate format used when performing a 2D to 3D conversion, since only one eye (a 2D photo) is needed. This is a special format for the Vuzix VR glasses. 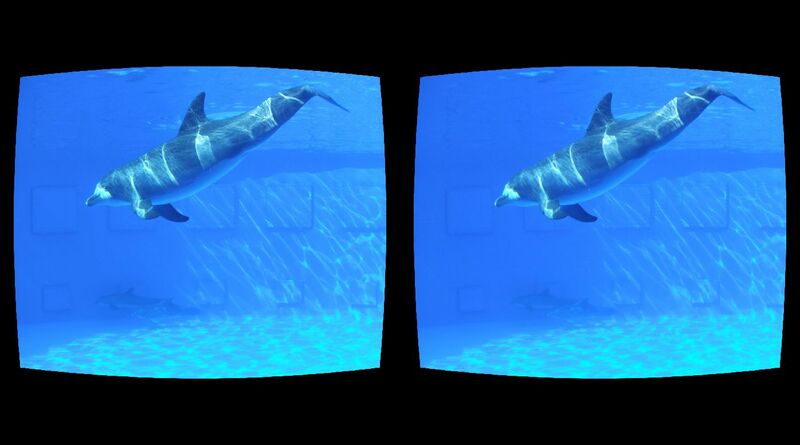 These images will appear in 3D when connecting the glasses to a PC or any other media player. The linecode at the bottom indicates to the glasses that this is a 3D image. There are several supported Vuzix 3D formats. 3DCombine can recognised and process them automatically. This format consists of 8 or 9 separate images from different viewpoints. It is required for some auto-stereoscopic displays. 3DCombine can generate these automatically from a 2D + Depthmap image. Typically these must then be interlaced using an algorithm specifically tailored to the display device. This is the format required by the Dromax 3D Monitor. Cardboard is a VR format from Google. 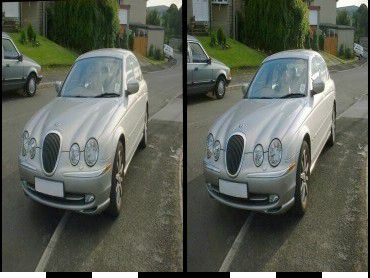 It uses a parallel image format, but the images are corrected for the distortion filter that the Carboard viewer creates. Both images and videos can be created in Cardboard format using 3DCombine. Simply add the Cardboard filter and save using the parallel format. The images/videos can then be viewed in the gallery on your phone. These cameras are fitted with 'Fisheye' lenses. These allow a very wide field of view to be captured, suitable for viewing in VR. 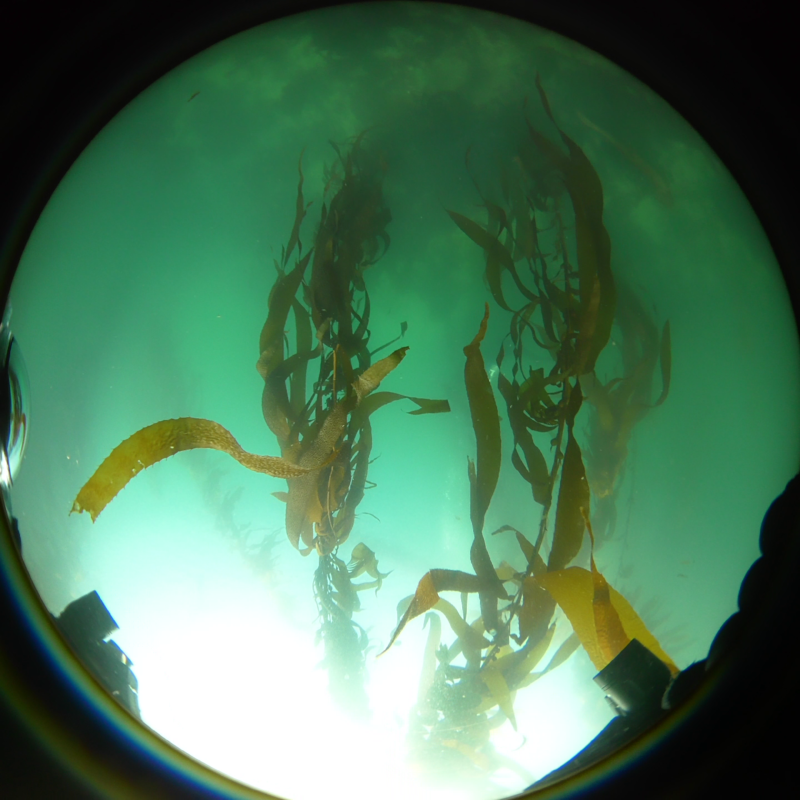 Typically multiple lenses are needed for a full 360° view. 3DCombine can correct the distortion to create either standard 3D stereo pairs or equirectangular projections which can be viewed in VR. It also allows stereo corrections to be applied and can perform stitching for certain cameras. The file extension for VR180 image files is VR.JPG. These are natively supported by 3DCombine and will appear 2D in viewers that don't support them. A final format to discuss is the MPO [Multi Picture Object] format. This is used by the Fuji range of 3D cameras and contains two full colour, full resolution images in JPEG format. However unlike the parallel format, software that only supports 2D images only sees one of the eyes and so it appears as a normal photo. 3D aware software can extract the second eye and display a full 3D image. 3DCombine supports the .mpo.jpg format. Images saved in this format appear as 2D when viewing them in Windows Explorer or preview applications, but 3D when opened in 3DCombine. This is arguably one of the best formats to use to store 3D images. Similarly, there is a dual stereo format for 3D videos where the left and right eyes are stored in separate streams. 2D programs can display one of the streams while 3D aware programs can extract for for a full stereo image. Copyright (c) 2019 Richard Scullion, RPS Software.